Centrifugal Blowers making use of External Rotor Motors have wide applications in UPS, Control Panel, Railways, Rectifier, Blow Molding machines etc. Centrifugal Blower has high efficiency and low noise level, relatively small airflow with high static pressure. It is a space saving blower. 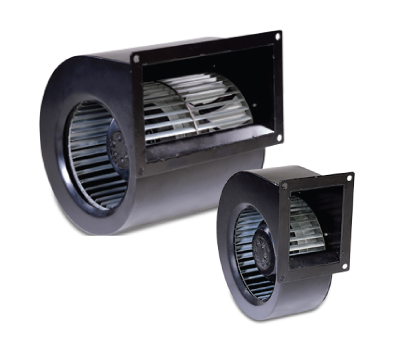 These Centrifugal Blowers are available in either single or dual inlet. The single inlet external rotor motor is integrated in the impeller, which is mounted onto the side wall of the scroll housing. Dual Inlet Blowers have extremely low structured vibration rates. What is a Centrifugal Blower? Centrifugal Blowers are also known as Centrifugal Fans.The kinetic energy produced by the impellers of the Centrifugal Blower Fan on rotation is used to increase the pressure of the air stream, which in turn moves them against the resistance caused, by ducts, dampers and other components. Centrifugal fans accelerate the airstream radially, changing the direction typically by 90o of the airflow. At a constant fan speed, centrifugal fans pump a constant volume of air. They are capable of operating over a wide range of conditions. Hicool manufactures single inlet and dual inlet Centrifugal Blowers of frequency 50Hz. These fans are available in 230 VAC and 415 VAC. These industrial blowers are available in various wheel diameters ranging from 133mm to 400mm. These Blower fans are highly efficient and have a low noise level and have relatively small airflow with high static pressure. These fans are a space saver. Centrifugal Fans are noiseless, sturdy, reliable and capable of operating over a wide range of conditions. These features of the centrifugal fan makes it ideal for use in the HVAC industry i.e. Heating, Ventilation and Air Conditioning.